Among several emergency services a huge prominence is given to medicines. In the everyday life, on any health issues we always depend on medicines and sometimes we need it on extremely urgent basis for which it is important to have chemist shops in the locality. 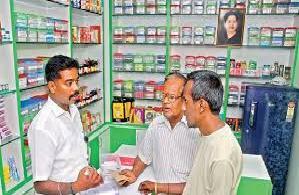 It is the well administration of Ernakulam district that it has some of the best well stocked medicine stores spread across the district. They have availability of all kinds of medicines and exclusive services like discounts on billing and home delivery facility. This way one can get their needed medicine at their residence only. Again there are some chemists in Ernakulam district which are open 24X7 so that in any emergency they can facilitate the patients with needed drugs. Apart from this many chemists have availability of oxygen cylinders for patients. To get access to the best rated medical stores, below is a list of chemist shops operating in Ernakulam district.